Spoiled by marquee-worthy acts, VIP clubs and theme-park-esque resorts, Las Vegas is one city that doesn't really operate on time. In fact, you likely won't see clocks in the casinos, because who needs to be reminded that it's 3 a.m. when you're doubling down at the blackjack table? That said, the best time to take a Las Vegas vacation depends on the visitor. Weather is a huge consideration: From June to September, the mercury hits 90 degrees Fahrenheit and can flirt with 100-plus degrees. If that's too tropical, visit Vegas during off-peak seasons such as fall and winter, when the crowds thin, hotel rooms are plentiful and the weather is bearable. Pretty rebellious for such a swanky bistro to hide in a business park in Summerlin. From the Black Dragon cocktails and plush booths to the torch-lit patio and tiramisu, this neighborhood gem takes the Strip to task. Book a tee time after 11 a.m. in the summer and golf at some of the top golf courses for 50 percent off. Just drink a lot of water and bring the sun block. Everyone thinks Las Vegas is a big desert, but once you get up in the higher elevations we have some of the most picturesque forest areas around. Try Mt. Charleston, one hour from the Strip -- when it's 100 degrees in the city, it's only 80 there. Mt. Charleston is part of the Spring Mountain Range and Toiyabe National Forest, which boast great hiking, picnic grounds and waterfalls. The Resort on Mount Charleston offers midweek specials throughout the year on Orbitz. Check out the Pinball Hall of Fame, where people flock to play pinball machines from the 1950’s until the present. The newest addition is “Insert Coins,” a lounge/arcade located in Downtown Las Vegas. From Atari 2600 to Xbox360, you'll find it all here in a club-like setting. When you get tired of playing Pac Man, step onto the dance floor to get your groove on. 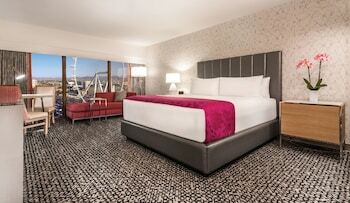 Start making plans on your fabulous Las Vegas vacation! Let the travel experts at Orbitz create irrestistible flight and hotel options. Pick out your preferred hotels, airfares, experiences and rental cars to save as much as $857*! Packaging your bookings is one of the simplest ways to save cash. To top it off, our comprehensive database lists no less than 500,000 hotels worldwide and 500 airlines. Don't stress if you have trouble selecting the right ones — we'll make it a breeze! With endless possible options to pick and choose from, our packages let you design that trip you're dreaming about. We've devised an easy system that rewards you quicker than anyone else. All you need to do is continue booking with us and you'll collect instant Orbucks! 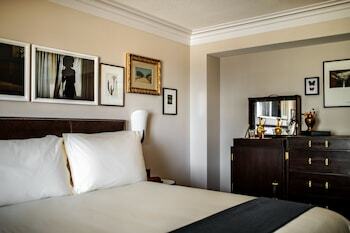 Want perks, like complimentary breakfast and Wi-Fi, at all Orbitz Rewards VIP Hotels? Just stay four nights for gold status and 12 nights for platinum in a year. And, how do you redeem your Orbucks? It's a cinch! Just make use of your Orbitz Rewards points on the following booking. One of the best parts of traveling is the anticipation. Start getting excited about your Las Vegas getaway by finding out a bit more about it! This destination is approximately 330 miles southeast of Nevada's capital, Carson City. Las Vegas is also 13 miles northwest of Henderson. The population of this area of Clark County is roughly 600,000. Kick off your sightseeing adventure by spending a couple of hours at the Las Vegas Convention Center. All year round, hordes of visitors journey to Las Vegas to take in this top-notch sight. 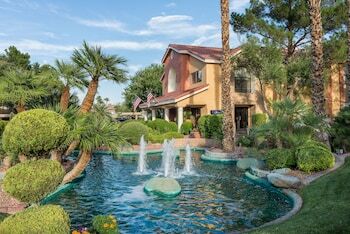 In Las Vegas you'll discover a range of terrific tourist attractions, like Fashion Show Mall and Las Vegas Premium Outlets. Make sure you set aside time to see them all! Immerse yourself in the calm environment at Clark County Library while skimming over the books, journals and periodicals. Seeking some more options? See the colorful creatures swim around, try to identify them and learn about their lives at Shark Reef at Mandalay Bay. It's a fun and educational place for the entire family. But that's not all there is! For many of us, it's just not a vacation without a few hours or more at the mall. Make your way to Boulevard Mall where you can spend the day looking around its impressive selection of retailers and food joints. Las Vegas is calling your name, and the best way to see it is with your own wheels. Search, compare and reserve car rentals in Las Vegas in just a few clicks with Orbitz. Ready to roll? Why panic about cab fares? Pick up a car directly from the McCarran International Airport area. Drop by Enterprise, one of the closest outlets around. Hertz is right in the heart of the city. All you need to do is make your way to 3555 Las Vegas Blvd S. Why don't you also try Avis? They can be found at 3600 S Las Vegas Blvd. Don't miss out. 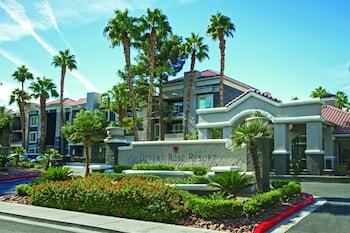 Book one of 170 hotels in Las Vegas and begin organizing your activities. Want a room that'll make you feel like a film star? 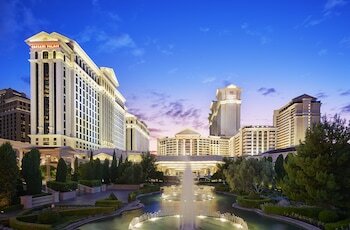 Our favorite upmarket hotels are The SKYLOFTS at MGM Grand and the Four Seasons Hotel Las Vegas. 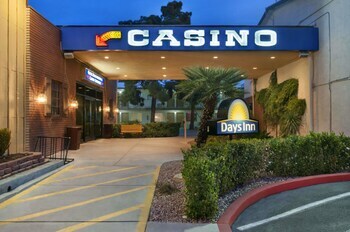 Or, the Roulette Motel (2019 Fremont Street) and the Manor Suites (7230 South Las Vegas Blvd) are suitable options for those traveling on a tight budget. Why not make seeing the Las Vegas Convention Center even better by booking accommodation nearby? 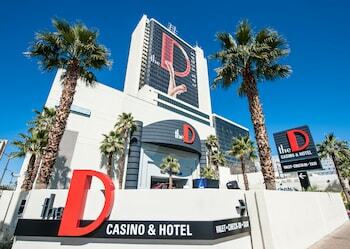 Two fabulous options are the Las Vegas Marriott, 0.3 miles away, and the SpringHill Suites by Marriott Las Vegas Convention Center, 0.3 miles away. Arranging some time out in Las Vegas? Lift your tray table, put your seat upright and prepare to land at McCarran International Airport (LAS), the nearest airport. 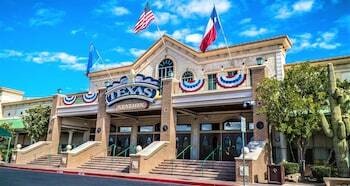 The entry point to your next epic adventure, the terminal lies 2 miles to the southeast of the downtown area. 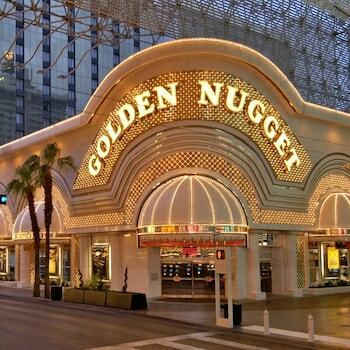 While you're in Las Vegas, why don't you stop by some nearby destinations? Primm, just 35 miles away, gives access to the Primm Valley Golf Club, a much-liked attraction. Want another reason to visit? Fashion Outlet of Las Vegas is also within reach. Canceling or making changes to a booking can often be a hassle — but not with us! We won't penalize you with a fee, which will make it hassle-free.^ Airlines and hotels sometimes have the same policy, so make sure you contact them.